A significant limitation with ideals and idealism is that they can be practiced without much resistance only in a specific and limited context. You cannot stretch them too far or practice universally without inconveniencing yourself. History is the proof that ideals cannot universally be practiced without making adequate provisions for exceptions and practical considerations for the difficulty one may have in following them. We have elaborate laws and constitutional practices for the same reason. We have detailed law books about Dharma with copious explanations, provisions and exceptions to ensure that they are fairly and reasonably applied to human situations without disturbing the order and regularity of the world. The same principle holds true for all world religions, which aim to provide their followers with the vision of an ideal life that they are meant to follow to secure peace and happiness here and hereafter. Even with complete faith in their scriptures people find it difficult to practice them without hurting themselves or others in the process. As an individual and as long as you are not touching the lives of others, you may practice any ideal. However, when you try to bring your ideals to the public platform and expect the world to follow them, you will have a problem, and even a great risk to your life and Wellbeing. It happened to Socrates, who was forced to end his life by drinking poison from a cup for his methods and beliefs. It happened to Jesus Christ as he was crucified for the idealism he preached. In the proselytization of Asia and Europe, it happened to numerous Christian and Muslim saints, philosophers, religious reformers, free thinkers and heretics who held different views about the faith they practiced. It happened on a few occasions in India also during the Muslim rule. During the freedom struggle of India, Mahatma Gandhi faced many predicaments for the ideals he projected which were too difficult to follow. Out of respect for him people put up with his idealism, but felt the frustration at the limitations he imposed upon them using their loyalty as a leverage in the cause of freedom. He perhaps knew that his theory of nonviolence could be practiced at the best by individuals who had given up desire and ambition but it would be too much to expect it from hundreds of millions of people with diverse social, cultural and religious backgrounds who did not believe in it and who did not practice it. Although India was home to the doctrine of nonviolence, Indians rarely practiced it. Indian rulers regularly engaged in warfare even while practicing Buddhism and Jainism, and some of the worst and bloodiest battles in the history of the world were fought on the soil of India. Pacifism took shape in the heart of India but it never flowed deeply into the veins of the country. As a result, we have a dichotomy in the belief and practice of it. Hence, Gandhi himself had trouble preaching nonviolence during wars and communal clashes. Whatever statements he made during such testing times had the opposite effect of alienating him from all sections of society and weakening his leadership and personal appeal. During the second World War he was disliked by the British for the pacifism he preached and the advice he gave to them to surrender to Hitler and wage a peaceful protest to change Hitler's mind about violence and war. Although he called Hitler, "my friend," the latter held him in contempt for his nonviolent theories and perhaps, his racial background. He even hinted to the British to kill him and silence the freedom struggle. Hitler usurped the name Aryan from India for his political ends, but not its central doctrine of nonviolence. He ignored his own religious beliefs also about universal love in pursuit of his idealism to project Germany as a nation of superior humans. His idealism brought hardship to millions of people and a great destruction of life and property in various parts of the world. It separated children from their parents and parents from their homes. At the end of the War, it reduced Europe into a huge pile of rubble and a mass graveyard, creating doubts in the minds of onlookers about their own humanity. In a sense both Gandhi and Hitler were idealists but each with a different vision and philosophy. One believed in violence and dominance, and the other in nonviolence and inner strength. Both caused inconvenience and hardship to those who followed them and believed in them as the price of their loyalty and commitment. In the end both died in the pursuit of their ideals. One shot himself when reality stated at him, and the other was shot by another idealist who believed in a different vision of India. 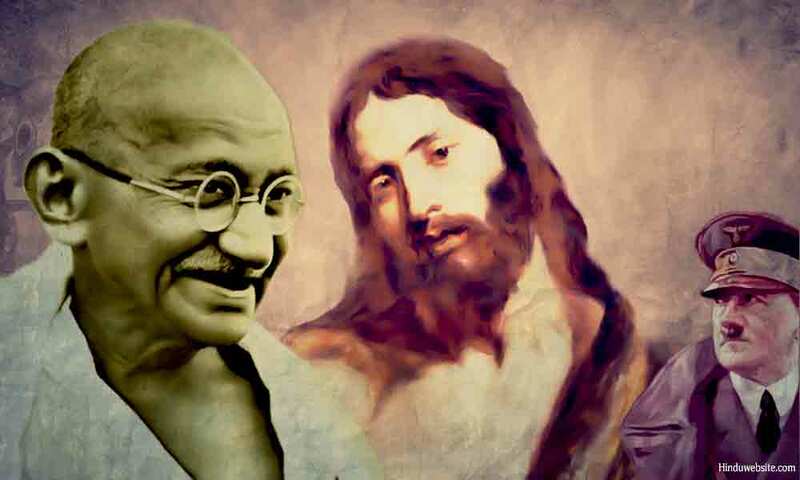 Gandhi, Hitler, and Jesus, they were primarily idealists who gave up their lives in the pursuit of their ideals. People may cringe at the thought of putting these three together and finding similarities about them, but what was common to them was that each believed in certain ideals and died for them in the hands of those who believed in different ideals. We may add to the list others, such as Bhagat Singh, Subhas Chandra Bose, and Martin Luther King. They too died in the pursuit of their ideals and dreams. The moral of this is that every ideal holds in its bosom certain destructive power which grows in proportion to the resistance it faces and the strength of those who uphold it and promote it. If you are an idealist, you should be careful how you may hurt yourself, your family, community, nation, or the world.